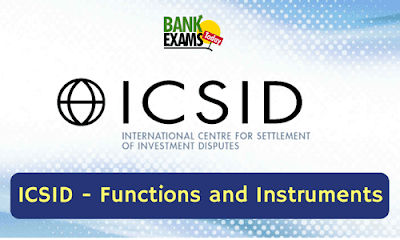 International Centre for Settlement of Investment Disputes formally established in 1986 via the Convention on the settlement of Investment Disputes between states and Nationals of other states or popularly termed as ICSID Convention. It has 161 member nations. Headquartered in Washington D C, the United States, it is one of the five organisations of the World Bank group along with IBRD (International Bank for Reconstruction and Development), MIGA (Multilateral Investment Guarantee Agency), IDA (International Development Association) as well as IFC (International Finance Corporation). Though the much-generalised objective of World Bank is Poverty Reduction, the five organisations particularly ICSID contributes towards the same via facilitation of conciliation as well as Arbitration of International Investment related disputes. Forum for Investor-State dispute settlement in International Investment Treaties, Investment laws and contracts. Promotion of International investment environment as envisaged in the ICSID Convention formulated by the World Bank. Facilitator of dispute resolution in state-state disputes under the ambit of investment treaties as well as free trade agreements. Acts as an administrative regulatory to take control of and to regulate investment relations. Settlement of disputes via conciliations, arbitrations or fact finding. Promotion of awareness with regard to the international law on foreign investment as well as the ICSID process. Promotion of transparency in international investment decision-making process. Effective application of detailed rules and regulations to ensure that there are efficiency and transparency in investment decision-making process. Appointment of Independent conciliation commission or arbitration tribunal to oversee and rules on issues as well as disputes. Provision of immunity from legal process for the participants in cases which are governed by the ICSID Convention. Detailed rules and regulations pertaining to the arbitration process. Being the forerunner of World Bank group as an investment related settlement authority, International Centre for Settlement of Investment Disputes fosters the objective of monitoring an Investment friendly atmosphere in the International Investment scenario. ICSID is performing the function of offering an undaunted investment environment to foreign, individual as well as governmental entities as an independent depoliticized entity, though emerging economic giants like India, Brazil and South Africa continues to elude the folds of ICSID.